This Baltimore No. 11 was made about 1885 by the J.F.W. Dorman company of–where else?–Baltimore. 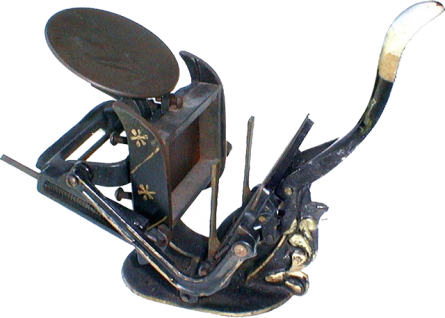 It is a well made, highly ornamented press; despite its small size, it is capable of doing good printing if the form is small. The press holds two rollers on one roller arm (The Baltimore pictured does not have its rollers attached). A similar press, the Baltimore 10, has only one roller.